Many Catholics desire to offer some of their time to serve Our Lord by volunteering their services to the Church by making Rosaries. A Rosary Guild may be formed by a number of men, women and older children meeting at a designated time to pray together and mutually enjoy the relaxing and spiritually beneficial art of rosary making. Guild meetings may be held at the local parish or in a volunteer's home. A skilled rosary artisan instructs newcomers and generally leads the guild members in prayer before work begins. The leader will be responsible for keeping on hand adequate supplies of beads and findings, and for general overseeing of the work being done. The leader or some other appointed person may be responsible for shipping the rosaries to Missions or other charitable organization. Forming a Rosary Guild or Club will require a true commitment of your spirit and your time. New members may appear at first, full of zeal and enthusiasm, but may never show up again for the subsequent meetings. Rely upon the help of Our Lady to send dedicated workers. A few devoted souls making rosaries are better than none, and you will reap amazing spiritual benefits from your service to Our Lord in making rosaries, getting them into the hands of those in most need, and spreading honor and devotion to Our Lord and His Blessed Mother through the instrument of The Holy Rosary. Getting the group started is the most difficult aspect, as it will require coordination of times, places and people. But once your group is established, meetings will flow smoothly. Some rosary makers may volunteer to work at home, and bring their completed rosaries to you at a specified time. If you hope to meet in a room or area supplied by the parish, you will need to meet with your Pastor or other parish coordinator to have the location and time approved. A simple announcement of your intent to form a Rosary Guild may graciously be allowed by your Parish Bulletin Committee. Obtain permission to post a notice on your parish Bulletin Board or other public location. Contact your Catholic School Principal and make arrangements to send a notice home with students if you are interested in leading a youth group of rosary makers...sometimes these are the most dependable and energetic! Young people aged 10 and older should be perfectly able to follow directions for making cord rosaries. If your parish sponsers a Girl Scout or other Youth Group, arrange to contact the leader about recruiting new rosary makers. You may wish to meet at someone's house rather than at a parish location. Invitations can even be sent out through your neighborhood to other Catholics, the elderly or shut-ins. Some dear soul with little to do and plenty of time may just be waiting on your invitation. During your first meeting, determine that this will be a time of interior reflection and prayer and not a gossip meet-up. Its up to you whether to provide refreshment. But we recommend the meetings center around rosary-making and not so much around socializing. Gathering to pray all five Mysteries of the rosary is always an ideal, but a simple prayer to open the meeting, or group recitation of one decade of the Holy Rosary is most appropriate. You will need to provide adequate seating and light, and a clean, organized workspace for your members. Time is important. Keep your meetings on schedule, beginning and ending at a specified time. Shoeboxes or small plastic bins keep parts organized, and provide storage for incompleted rosaries. In the room where our rosary makers meet, a Crucifix hangs nearby and images of Our Lord and the Blessed Mother provide inspiration to our workers. Draw up a simple announcement like the one shown above, inviting all interested persons to attend an "Open Interest" Meeting. These can be easily printed and distributed after Mass, or placed on a table in the vestibule of the Church, with Pastor's permission. At this meeting, determine how many rosary makers expect to participate, what day/night will fit the needs of the majority, and how often the group can expect to meet. Collect fees for the next meeting, and order your supplies. 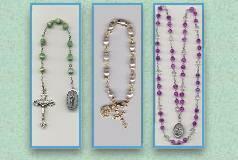 We offer a Guild Starter Kit through our Rosary Makers Shop. A 10 pack Rosary Guild Starter Kit includes findings, tools and beads to complete 10 rosaries, with printed seven page Cord Rosary Instruction Manual. If you'd like to start small, our kits will be ideal. 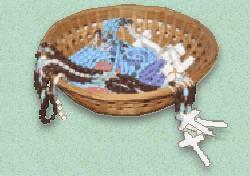 Our Kit will help anyone learn how to make a Cord Rosary, whether you'll be starting a Guild or not. Once your group is established, check our Recommended Suppliers to purchase bulk supplies at low cost. As a rosary maker you have known the joy and peace you have experienced while making your rosaries. You may have even experienced growth in your faith as you pray while you work. You know that little pang in your heart as you complete each new rosary.